This past weekend I had the wonderful privilege of being able to attend an amazing and extremely successful event held by BET called Black Girls Rock. I received an invite after having donated to the Black Girls Rock! organization in the past. I initially thought this would be a small panel of black women discussing the achievements and beauty of black women. But boy was I surprised when I found out that this was a full fledged awards show complete with performances by some of my favorite female R&B singers . I'm talking about Keisha Cole! Monica! Jill Scott! Keri Hilson! And Fantasia!! The gorgeous and classy Nia Long was hosting. I was reeling with excitement when I learned this to be true. The venue and attendees were a classy black girl's dream. Everyone from the security professionals to the attendants were professional and kind. I was ushered right up to the front to an available seat so I had a bird's eye view of all the celebs sitting down and performing on stage. The awards show honored everyone from the beautiful and classy young 17-year-old Keke Palmer to the first black female Major General of the United States Marcelite Harris. Toward the end they gave the Black Girls Rock living legend award to Ruby Dee, a sweet but still feisty woman who served to inspire me time and again as I watched her presentation. Even the band was made up of talented black girls who rock—the drummer was really doing her thing! Also toward the end, a quartet featuring Jill Scott, Marsha Ambrosius, Kelly Price and Ledisi rocked the audience's world. They sang a rendition of Four Women by Nina Simone, which ended with a standing ovation to end all ovations. This BET Black Girls Rock! event shook me to the core. It was so nice to see my own vision for the future of black women in America, as you can see from the establishment of this Classy Black Lady website, finally start to come to fruition. The event was dedicated to black girls and women out there struggling to make a way. It encouraged us all to keep pushing on because we are best that ever did it. Black women, we are the ish. I learned new things at this event, including a gem from Ruby Dee: "If you don't know where you're going, any road will take you there." I have decided to recommit myself to this website project and blog more regularly despite my hectic schedule -- my goal is at least 2 new posts per week -- thanks to the inspiration I received from attending this Black Girls Rock! Awards show. 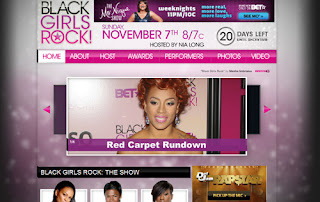 Listen classy black ladies, do not miss the televised broadcast of Black Girls Rock! 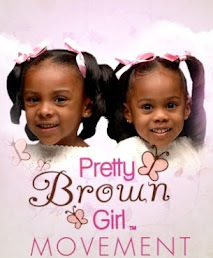 on BET, November 7 at 8pm. Be there or be square. Sit down with your young daughters, sisters, nieces, friends and mothers. Do not let this wonderful show for black women slip by you -- I never thought I'd be saying this but THANK YOU BET. And thank you, thank you, thank you to Beverly Bond, the founder of the organization. Please donate to the Black Girls Rock! charity by texting "IROCK" along with the dollar amount of your donation to 27138 or just visit the Black Girls Rock website. I told you classy black ladies in a blog post that our time was coming. Despite the media's attack on black womanhood over the past several years, still we rise. So what are you waiting for? It's time for you to make your move rockin' black girl, whether it's to start your own business, start a new and exciting career, make more positive black woman news, improve your community, motivate little black girls, or any combination of these wonderful and very realistic goals!